Temporary power system has been gaining increasing momentum in the recent years with growing dependence on the renewable energy sources. 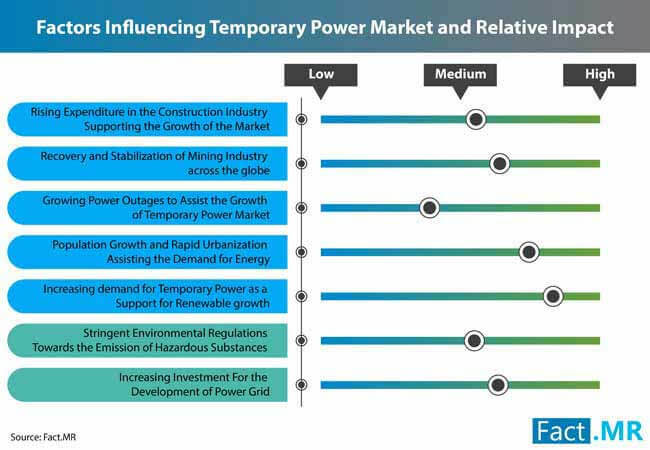 With economic growth, rapid industrialization, and infrastructural developments in emerging economies such as China and India, temporary power market is likely to gain high traction from Asia Pacific. In the latest market report published by Fact.MR, Asia Pacific temporary power market is anticipated to expand at an impressive value CAGR of 6.1% over the period from 2018-2026. This is mainly attributed by the growing demand for temporary power for mobile power needs, operations at remote places, and other requirements. Rising fuel prices and stringent government regulations on energy consumption have further led to the adoption of temporary power in the Asia Pacific region. Increasing demand for temporary power as a support for renewable growth is directly influencing the Asia Pacific market. Temporary power are highly sought after to use in the construction of renewable power generation plants and to eliminate their power discontinuity during unfavorable weather. This has led to surge in the growth of Asia Pacific temporary power market. Further, emerging issues of power outage due to imbalance in the demand and supply of electricity have facilitated the demand for temporary power solutions across various part of Asia Pacific. The Fact.MR’s study foresees revenue growth of temporary power market in Asia Pacific, which is divided into Asia Pacific Excluding China and China, to exceed a value of US$ 1,500Mn through 2026. China is expected to be at the forefront of the Asia Pacific temporary power market with the highest revenue share, which is likely to expand at a significant 6.5% CAGR over the forecast period. Government initiatives and investments on numerous infrastructural projects are estimated to enhance the growth prospects of temporary power market in China. Further, India and rest of Asia Pacific excluding China will possibly complement faster growth in the coming years. Along with Asia Pacific, the global temporary power market continues to be optimistic during the forecast period, driven by several macroeconomic and microeconomic factors. According to the Fact.MR’s study, the global temporary power market is expected to grow at value CAGR of 6.3%, attaining market value worth over US$ 7Bn by 2026-end. North America will continue to be the highest revenue contributor, accounting for one-fourth of the value share, which is expected to be attributed by increasing construction and oil & gas industry. In addition, expansion of global temporary power market in Middle East & South Africa is likely to significant over the forecast period. On the basis of power source, although the global temporary power market remains concentrated in diesel generator, it is likely to register a sluggish growth as compared to its counterparts. On the contrary, despite accounting for smaller share, solar generator has been envisaged to exhibit the highest CAGR of 13.7% during the assessment period. The end use of temporary power will possibly be consolidated in utilities segment. Oil & gas and construction sectors are further anticipated to contribute to the growth of global temporary power market.